*Green Rhinestones from Queen & Co. I made this bag and tag with a matching card. The Scissor Mouse was really fun to use once I got the hang of it. I used it to cut wavy strips from the DCWV Rockstar mat stack that I glued to my tag that it attached to the bag. Love the effect. I stamped right onto the cotton bag with a stamp from SU and some dye ink. I really love the way that the bag took the ink. I then attached some of the buttons and rhinestones to the bag. 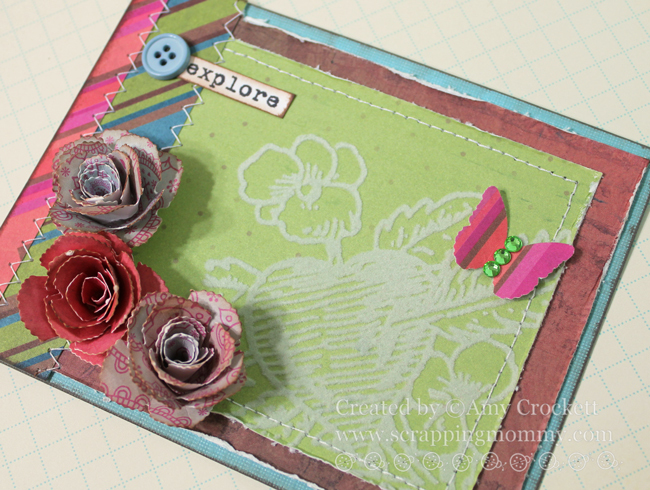 For the rolled flowers, I used some of the Rolled Flower Dies from My Creative Time and my Cuttlebug to cut some of the paper from the DCWV Rockstar mat stack and then rolled them into these fun little flowers that I used on the tag and also the card. 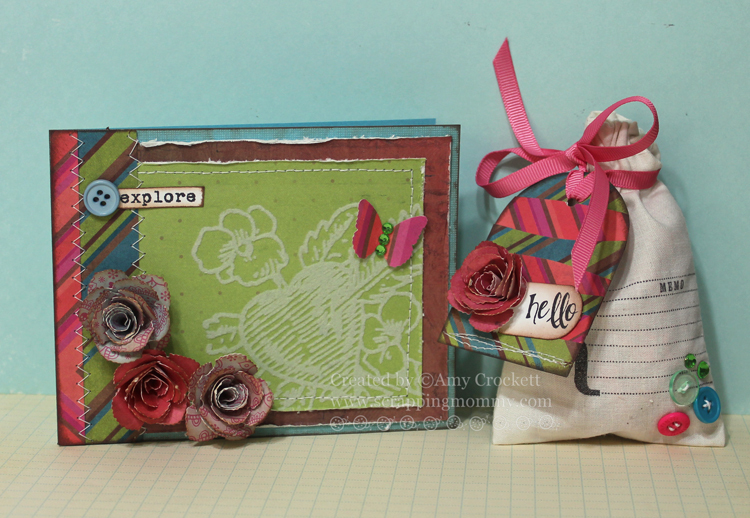 The "hello" sentiment is from the Scripted Year stamp set from Pink By Design. The butterfly is cut with a Martha Stewart butterfly punch and I added some of the Queen & Co rhinestones as the butterfly body. I also pulled out my sewing machine and added some stitching to the card and the tag. So, what do you think?? 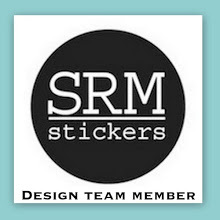 I know that they are going to have some kind of voting going on over on the Pink Cricut blog. I hope you will hop on over there and vote for my project CLICK HERE TO VOTE (my project is #3 but it looks like voting won't start until Sunday). =) Sarah said that if this goes as well as she hopes, she will have to put another one together. Very cute. I've never heard of a scissor mouse. I voted for you. Sorry can't vote until the 7th. But I wil. Super cute!! Love the stitching on your card! Oh, how pretty! Love your gorgeous papers and flowers! AMy ~ BEAUTIFUL card! LOVE the paper you used especially for your flowers! GORGEOUS! Oh the bag with the tag ~ LOVE it! Well I had to google the sissor mouse! OMG I need one of those!! 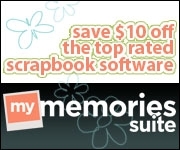 What a fun tool for so many things!! Eek!! Huge fan of stitching on projects and this card is phenomenal. 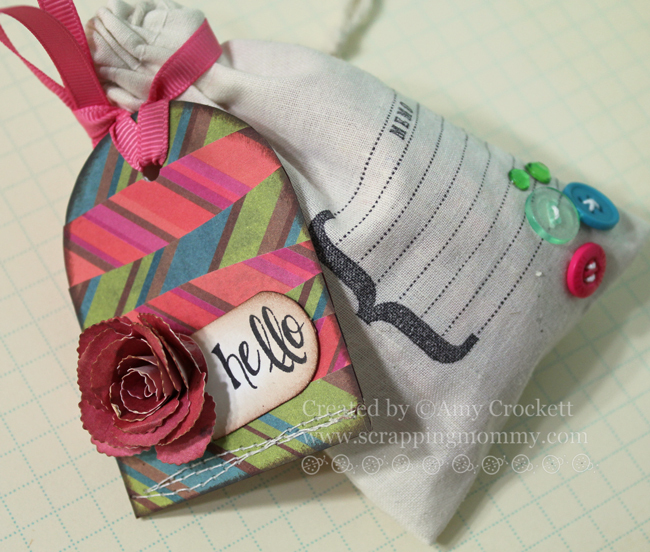 Love your bag and wonderful stamping, too. 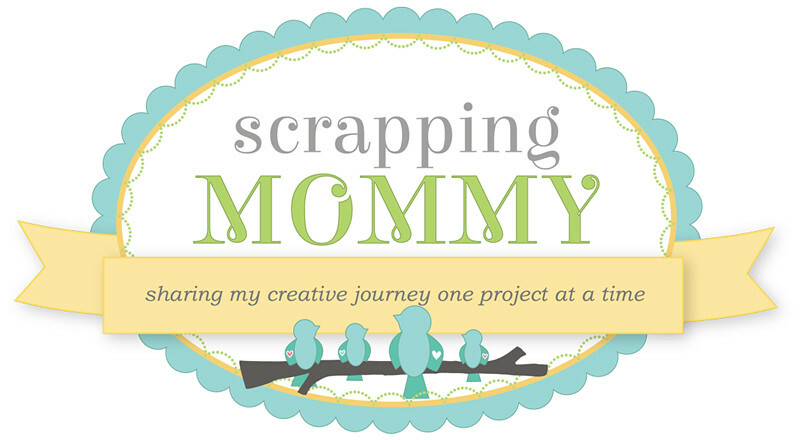 I absolutely love your companion projects! You did a fantastic job. I'm impressed that the ink didn't bleed on the bag. I saw an ad for the scissor mouse in PC Magazine, and I've been curious...I'm so glad you "tested" it out for me! I hope you win! Amy, I love it! The tag and bag are so cute! Your flowers are gorgeous Amy! I never would have thought that the papers you used were from the Rockstar stack! You combined them so well! What a fantastic set of items! Great job! This is a FABULOUS set!! Great job!! So so pretty. Love what yu did. I love this!!! Great idea!! Good luck!! !